Summer is a time for light and bright spaces with loads of sunshine streaming in the windows! The room in my home with the best natural lighting is our bedroom! And, you know that my favorite thing is to hang a sign over our bed – especially one with a lyric that is inspiring. For summer, this is what I came up with – “Good Day Sunshine”! How fun is that! Even though I don’t sell as many signs in my shop as I once did, I still love to create them for my own home! So, have I got you singing this old Beatles tune right now! I hope so! Music just lifts the soul! Here’s a closer look at the sign. If you’ve been following along here for a while, you know that those amazing wood planked walls are actually wallpaper! My sister-in-law was here last week and she could not believe it wasn’t real wood! She even went up and touched it!!! It is a dimensional (or blown) paper, which gives it a more realistic look than a flat wallpaper. You can find it HERE. I also get asked about my buffalo check headboard quite a bit. It’s a DIY project that goes way back on the blog. 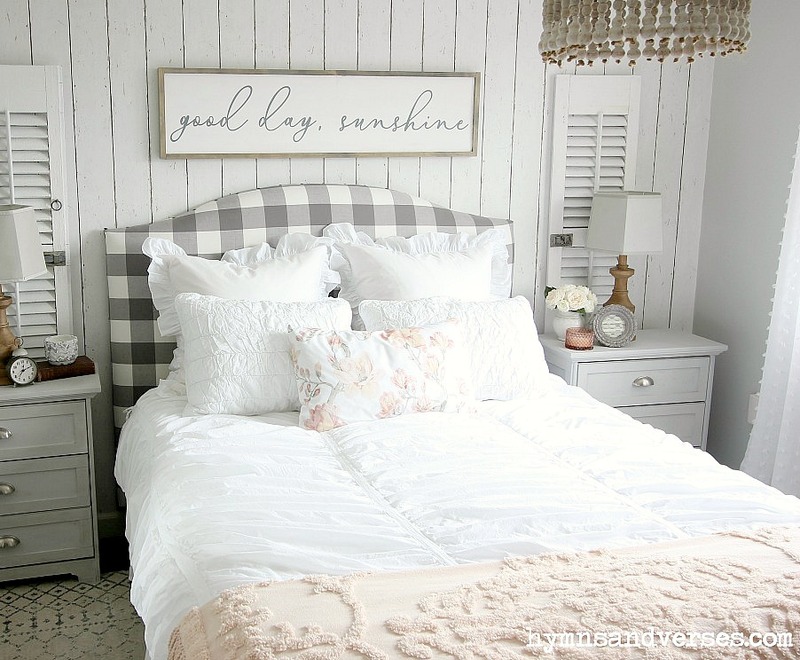 The headboard started out gray, then I changed it to white, and finally this buffalo check (my favorite)! Making your own upholstered headboard isn’t as hard as you might think. You can see how we made ours HERE. 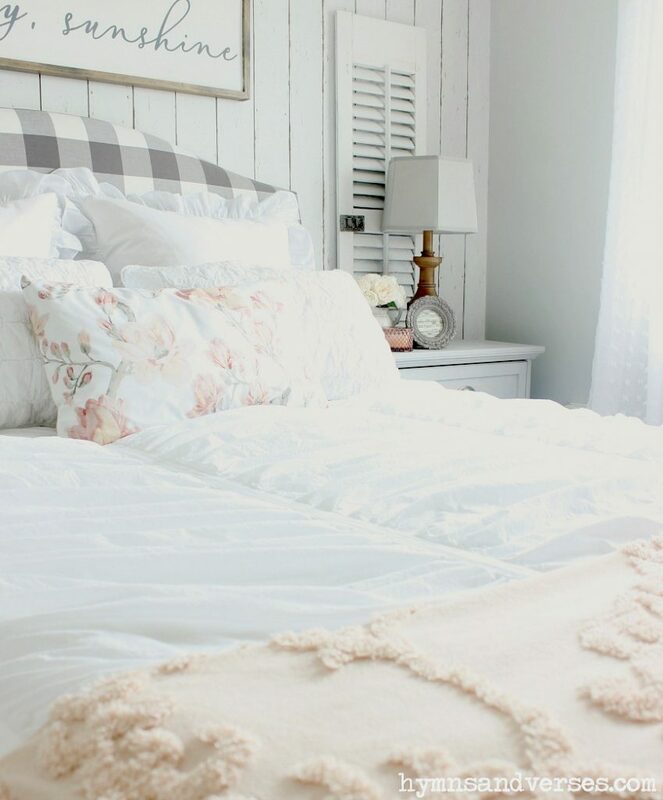 Did you notice the pretty chenille throw at the bottom of the bed? It was the inspiration color for the other accessories in this light and bright summer bedroom. It’s a light blush pink and has fringe on the ends! It is really affordable and also comes in white and gray! I may eventually get those other colors because I love this old-fashioned look! You can see it HERE. The white duvet cover is THIS ONE from Pottery Barn. I found it at a steal-of-a-day at the PB Outlet. It was under $50 and I love the romantic ruching detail and it’s so well made. I’ll be using this find for many years to come! 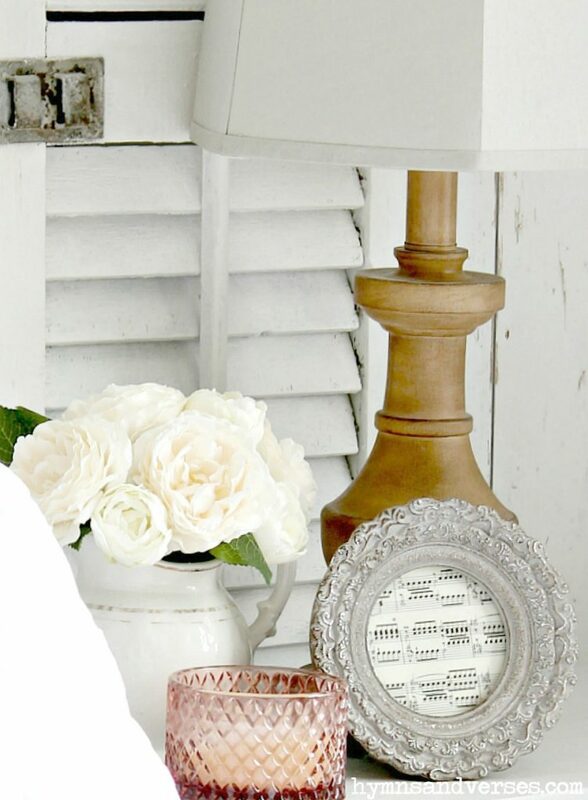 I added an antique pitcher with pretty pale blush blooms and a cut glass candle to my nightstand! 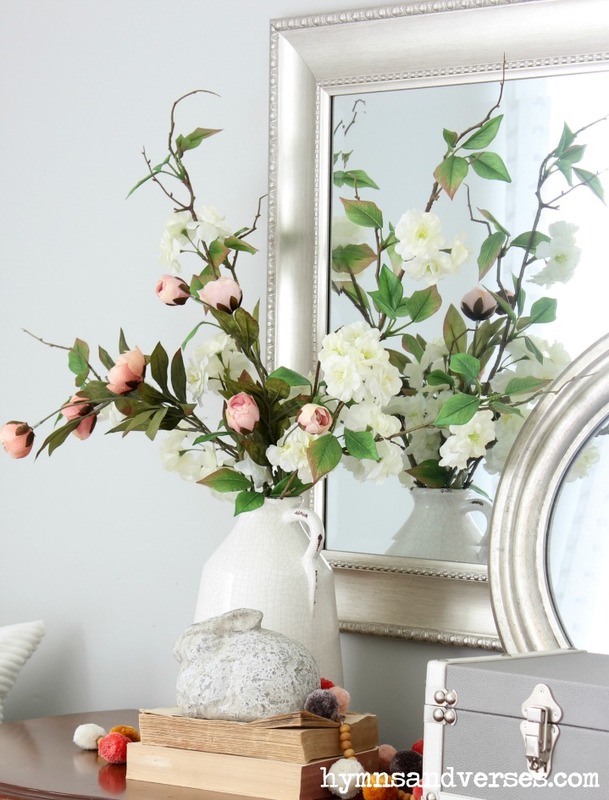 I added a few more peachy pink accents on our dresser too. 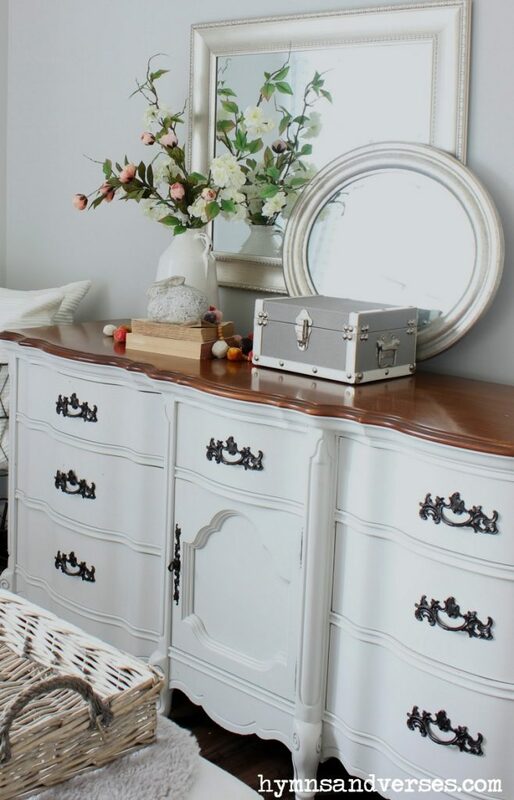 This gorgeous dresser was an auction find several years ago! It’s one of the first pieces of furniture that I painted with chalk paint and it has really held up! I left the wood top because it was in great condition. I got the pom pom and wood bead garland at Target in the spring. I loved the colors of the pom poms – pink, coral, gold, off white, and gray! The cement bunny is also from Target. 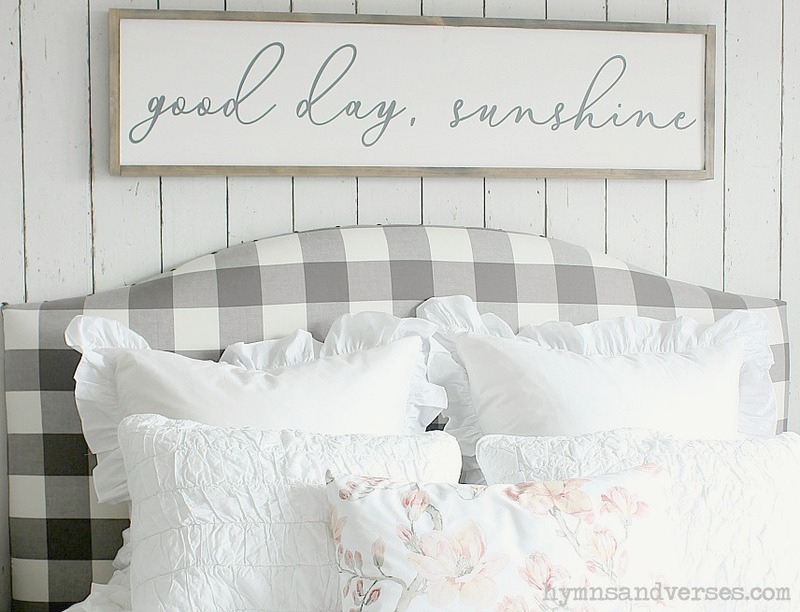 I hope you enjoyed taking a look at how I added a few inexpensive pieces and a whimsical “Good Day Sunshine” sign to give my bedroom a light and bright look for summer! Oh so pretty. I love it all. So pretty Doreen….I really like your sign! and your bedroom is perfect. Simple but elegant! Just beautiful! Good day sunshine is exactly what i saw in that bedroom, all over. I love chenille it is such an old beauty brought back and the flower throw pillow, you did make a lovely place to sleep. I want to plop down on that bed badly! LOL! What a delightful place to cozy up with a good book! Simple and so pleasant to look at. Completely relaxing. Perfect way to start the day! Where did you get the floral pillow on the bed? 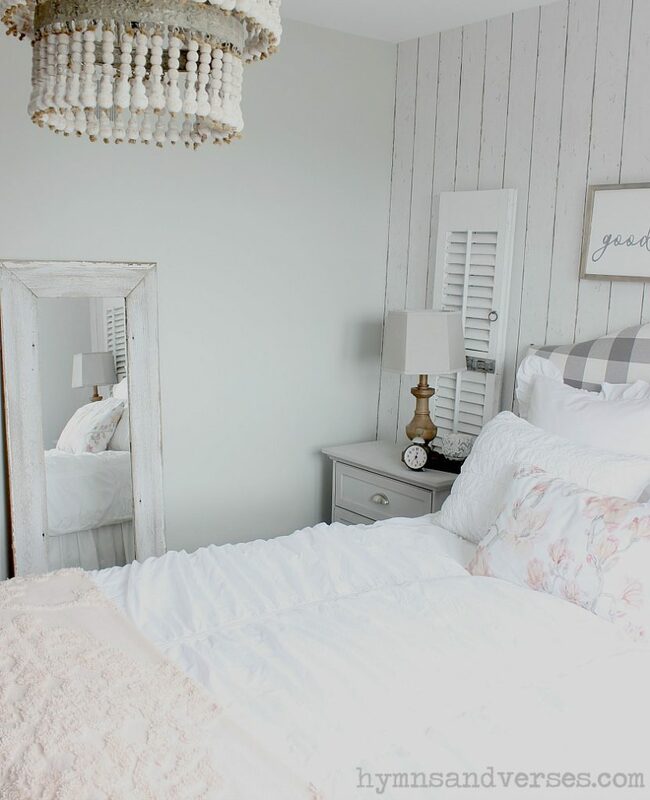 I just love this beautiful summer bedroom. These pictures are awesome. Much appreciated for sharing this post.